Thick, sturdy, crunchy chips...each one generously dusted with roasted parmesan and garlic flavor. I like these to go perfectly with dips, because they are hard enough to stand up to heavy toppings. Beware though, they are extremely crunchy and require some serious molar action, unlike say your standard potato or tortilla chip. But the flavor is wonderful. There is a slight hint of a "burnt" flavor (I'm calling it roasted), but it's the kind of burnt that you would taste on the edges of a cheese-topped lasagna. So delicious, so savory, so satisfying. 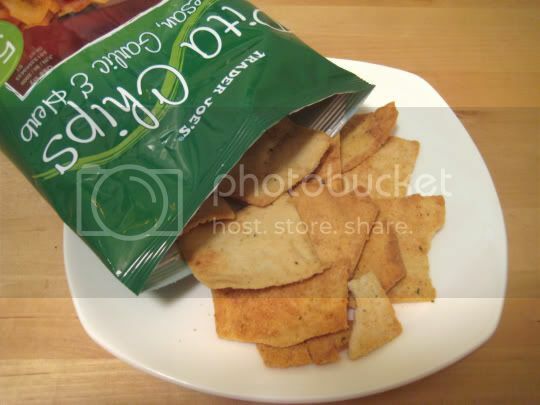 These pita chips have just the right amount of salt, probably coming from the nutty parmesan flavor. Buy again? Definitely. Spinach-artichoke dip would be a perfect complement to these.